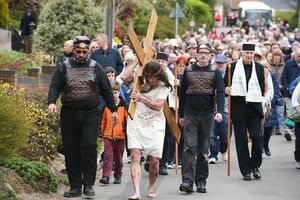 The idea of doing a Passion Play was first voiced by Paul Connelly, a much-loved member of the Reedham community, whose wife runs the Post Office. By the time the idea started to take shape Paul was ill. He died on 19th December 2016, and the play is dedicated to his memory. The play was never intended to raise money for the church, as it was an act of witness rather than a ticketed event. However, recognising that some people would want to donate, we chose to support the East Anglian Air Ambulance, who agreed to be present at the village hall on the day.